Cone 10 High Fire Dry Glazes are sold dry by the pound in paper sacks. 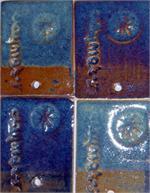 Dry glazes are mixed thick or thin based on application. Start with 10-11 ounces of water per dry pound(16 oz) of glaze. Add another ounce or two of water per pound for clear glazes, or for spraying applications which thin is better. Brushing application is best done thicker, with the addition of Brushing Medium. Sieve all glazes before using for best results! All tiles have a thin coat on bottom third, Medium in the middle heavy coat at top third of each tile.